Welcome to another of our wonderful mid-season pop-up concerts! Never satisfied with our full years’ programme, Corpus Medicorum is ready to impress with some of the gems of the Classical period repertoire. We are thrilled to be playing with Christian Li who won the Yehudi Menuhin prize in 2018 at the age of 10! He will perform Bruch’s ever-popular Concerto for Violin. And then to continue our Beethoven love-affair, Michael Dahlenburg is back on deck with his spell-binding interpretation of the marvellous Seventh Symphony. Finally, a concert showcasing two worlds poles apart - Sibelius and his grand Finnish 2nd Symphony together with our own wonderful composition celebrating the Greek Diaspora in Australia - Stefan Cassomenos and his Australian premiere of his joyful Concerto for Two Pianos. Stefan is joined by Aura Go for this piano and orchestra masterpiece written especially for Corpus Medicorum for their 2018 European Tour and premiered in Thessaloniki, Greece. We are thrilled to welcome Melbourne's very own superstar conductor Ben Northey to the podium. Corpus Medicorum presents its first concert for 2019 in our ‘Patriots’ Concert Series. Three of our favourite Russian composers feature some of their most stirring music invoking their Russian Homeland. Glinka’s famously furious Overture is followed by Prokofiev’s extraordinary First Violin Concerto. Who else but Rachmaninov can stir patriotic feelings with his highly romantic First Symphony. Welcome aboard to the Corpus Medicorum Solar System Explorer! 2018 is a stellar year for Corpus Medicorum including our Tour to Europe now culminating in an unforgettable ride through this wonderful musical soundscape. Holst’s magical masterwork has something for everyone from Mars the Bringer of War to the mystical world of Neptune complete with off-stage Female Choir! We begin our concert with a Pomp & Circumstance March of Edward Elgar and the great Viola Concerto of William Walton played by our very special guest Caroline Henbest. So buckle up and join us in our English-built Rocketship for a fantastic ride through Outer Space! Corpus Medicorum is DESPERATE to play and we yielded to our temptations to bring you another of our famous Pop-Up Concerts this time at ANAM Sth Melbourne Town Hall. 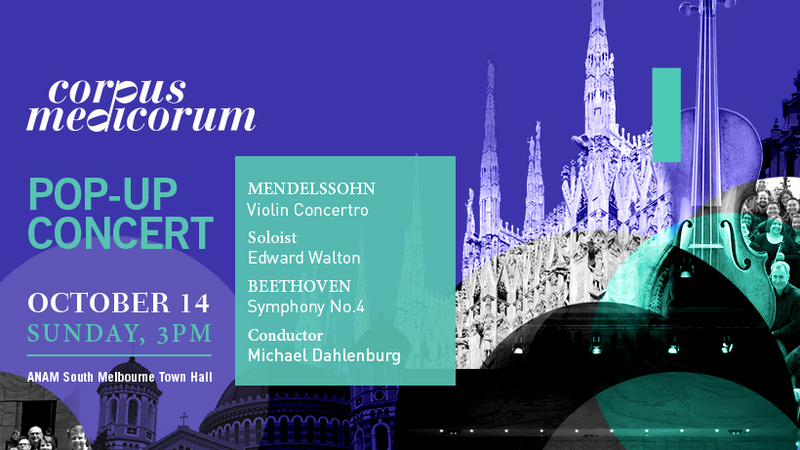 Michael Dahlenburg is at the helm with an exciting programme including Mendelssohn’s magical Violin Concerto featuring young Melburnian Edward Walton, and then the classical repertoire’s most classic symphony - Beethoven Symphony No.4. Join your favourite orchestra for an awesome Sunday afternoon of musical medical magic. Conservatorio Statale di Musica di Milano "Giuseppe Verdi"
A Picture tells a Thousand Words - imagine when you then add a grand Russian Masterpiece of Orchestral composition! Corpus Medicorum presents its “Pictures” concert - alive with visual and sound imagery. The programme starts with Dvorak's boisterous and popular Carnival Overture full of sounds, colours and light. We are then transported to the stillness of the Finnish lakes to see Sibelius's timeless Swan of Tuonela gliding across the water. Then the Devil dances amongst us in Saint-Saens quirky Dance Macabre. And Mussorgsky’s jewel - Pictures at an Exhibition - arranged by Ravel brings alive 13 Grand Art Works of Viktor Hartmann. Join us to see, hear and be a part of our rich tapestry of sound! You want tightly controlled musical structure? Beethoven Piano Concerto no. 4: check! You want unusual and interesting musical architecture? Beethoven Piano Concerto no. 4: check! You want richness, you want lushness? Rachmaninov Symphony no. 2: check! Conductor Keith Crellin, piano soloist Mekhla Kumar and the medical musicians of Corpus Medicorum offer two powerful pieces, written precisly one hundred years apart, vastly different in style, yet united by emotional power and passion. Check it out! CORPUS MEDICORUM at the MEAT MARKET! It's been too long between drinks and we are itching to play....! Corpus Medicorum will present a chamber concert at Melbourne's historic Meat Market to welcome The Peter MacCallum Cancer Centre to the Parkville Precinct. Many of your hard-working musical medics now have a new home and join Australia's largest medical neighbourhood to form The Victorian Comprehensive Cancer Centre. We present an exciting chamber concert with Haydn's popular late classical symphony no.94 "the Surprise" and everyone's favourite Peter and the Wolf by Sergei Prokofiev. The concert will showcase Corpus Medicorum's core of principal players under the very able direction of Michael Dahlenburg. We are very excited to welcome Paul English, renowned Australian actor, to narrate Peter and the Wolf. The concert will be FREE for any inpatient at The Royal Melbourne Hospital, Peter MacCallum Cancer Centre, The Womens Hospital, Melbourne Private Hospital and The Royal Childrens Hospital if they are allowed a couple of hours of day leave. Remember there will be plenty of doctors at the gig! All welcome, attendance is free.